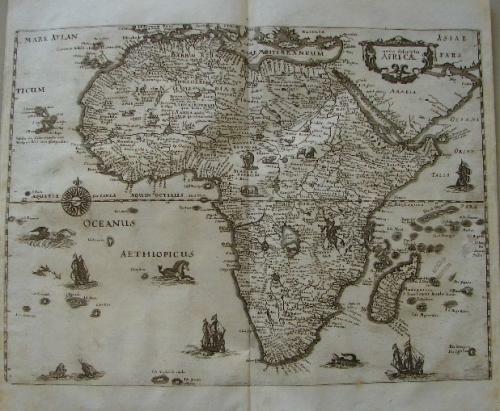 A most decorative 17th Century map closely copied from Blaeu. The Nile is shown according to Ptolemy, with its sources arising in the lakes Zaire and Zaflan, as well as many other fictitious details. It is embellished with numerous ships, sea monsters (including a great sea-horse), a compass rose and exotic animals wandering all over the continent. In very good condition with mild toning in the margins and a very minor centerfold toning.